The Oselvar is a wooden clinker built boat which has been built in this area for a long time. Clinker building is a construction technique that goes back to the 4th century in Norway. 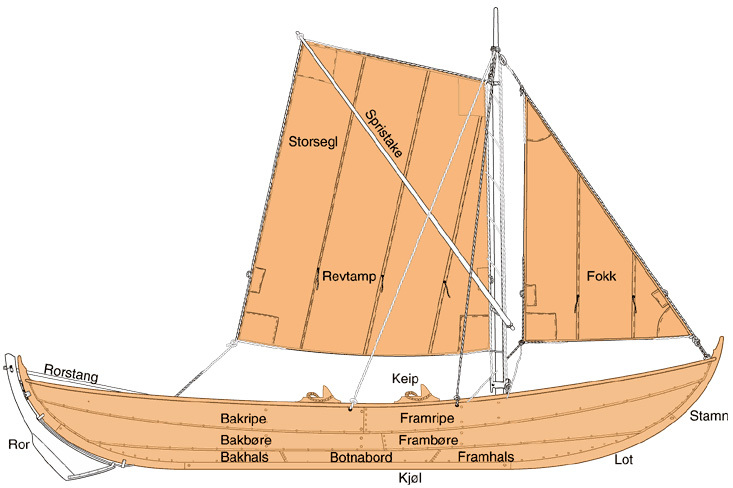 Viking ships were built the same way and some small boats from this time look very similar to the Oselvar. Boat builders have remained loyal to traditional building techniques and the boat has probably not changed form since before 1600s, when written sources first describe the boat. Oselvar boats are built in different sizes between 5-10 meters in length. They are made for a wide variety of purposes, for example racing, freighting or fishing. In accordance with the tradition every boat is individually designed and tailored for each customer. The boat-builders engage in all parts of the 500-600 working hour process building a new boat: dialogue with forest owners, inspection, cutting, transport, processing and storing of materials, dialogue with customers, planning of the building, purchasing nails, screws, fittings, tools and varnishes, building the boat, varnishing, rigging and mounting of fittings, thorough plenary review and assessment of each boat and testing together with the customer.